In the Main Switchboard, Click Add-Ins, Utilities and Repair HWDATA. You can try to repair the data when the calendar is running slowly. When Handyworks won’t open and you keep getting the message: “Point me to the location of your data”, it likely means that your hwdata is corrupt. In the past, you would have to exit the program and manually try to repair the data. BUT NO MORE! 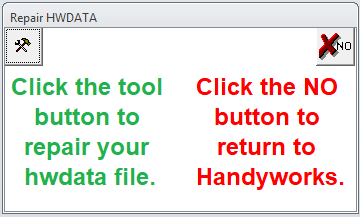 Now, when you get the “Point to me” message more than once, HandyWorks will ask if you want to try to repair the data. If you say “OK”, repair will be attempted, and if successful, you will get another attempt to connect to your data. If the repair fails, you will be prompted to call tech support. And always, for your own sake, have recent backups. For as we all know, “stuff” happens.